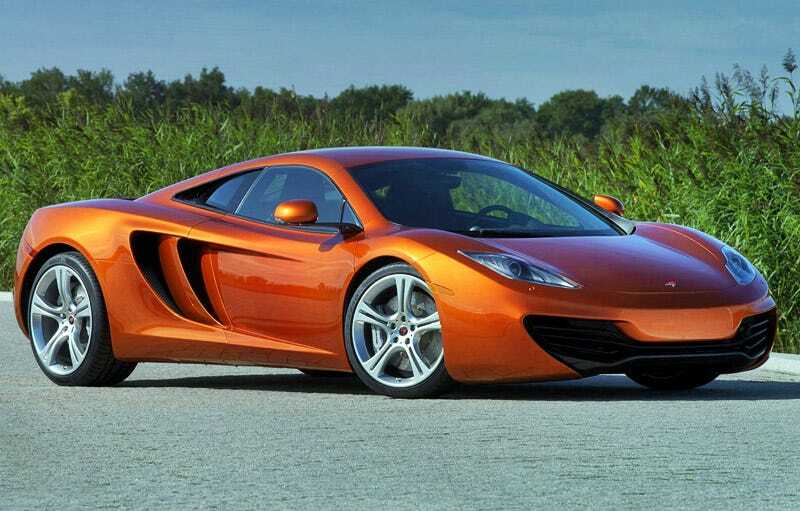 Last night we brought you first photos of the McLaren MP4-12C, the super car successor to the vaunted McLaren F1. Now we've got a mega-load of new pictures and very, very complete details. It's not every day a new road-going car from McLaren comes out, so the gents from Woking, UK unloaded with a super car load of detail this morning. So let's get down to brass tacks. The MP4-12C is set to slot into the $200,000 to $280,000 USD price range with a host of customization upgrades making that high figure readily attainable. But for that price tag, you'll be getting something totally bespoke. McLaren's taken great pains to dispel widely held assumptions this car would be a parts-sharer with Mercedes. According to the company, this is an all McLaren effort, from the carbon fiber chassis to the active suspension to the 3.8-liter, 600 HP V8 engine, right down to the buttons and switches. And speaking of that 3.8-liter engine, at its core, the MP4-12C will be all about performance. It starts with the McLaren "M838T," a twin-turbo V8 with an 8,500 RPM redline developing in the neighborhood of 600 HP and 442 lb-ft of torque, 80% of that available from 2,000 RPM. It's hooked up to the McLaren seven-speed Seamless Shift dual clutch gearbox (SSG) which features an amusingly named "pre-cog" function to prime the transmission for "lightning fast" shifts. Driving modes include full auto, sport, launch control and winter modes (for all you McLaren drivers who drive in the winter). All that drives the rear wheels and the car is controlled with an active suspension featuring dampers all tied together through a hydraulic system and able to deliver a smooth ride or blistering handling. That hardware rests in an all-carbon fiber monocell designed with F1-style elements and over-the-top rigidity, allowing for more aggressive suspension tuning, better crash safety, and well, just being awesome. Why do we say that? A variety of reasons, first, the whole Carbon Monocell weighs in at only 176 lbs, second, it's done in one piece and only takes four hours to build, which is on par with or faster than steel frames take, third, it's still got front and rear crash safety, utilizing extruded aluminum pieces to act as crumple zones. To put it all in perspective, the MP4-12C's monocell is 13 times less expensive to build than the one in the McLaren F1. That's some impressive work. Of course, this being a "modern" super car, the MP4-12C wears all the interior compliments expected at the price point; beautiful design, fancy leather, navigation, telephone connectivity etc. As important though, if not more so, the car was designed to fit the 98th percentile male, which means they did a lot of work packaging this car as something almost anyone can drive — not real common in super car circles. We're very much looking forward to hearing more about this car, and McLaren, if you're listening, we'd be happy to develop our own performance figures so conspicuously absent in the press release. * The Carbon MonoCell not only reduces the weight of the structure but also allows for the use of much lighter weight body panels. * The close position of the driver and passenger allows a narrower, lighter body while giving improved visibility with a clearer perception of the car's extremities. * Brakes with forged aluminium hubs save 8 kg and weigh less than optional carbon ceramic brakes. * Lightweight exhaust pipes exit straight out the rear of the car, minimizing their length and weight. * Airflow-assisted Airbrake deployment dramatically reduces weight of the Airbrake activation system. * Small, compact downsized engine coupled to lightweight compact SSG minimizes vehicle length, weight and polar moment of inertia. * Significant weight was pared off the alloy wheels through intensive Finite Element Analysis of wall thicknesses. * The engine cooling radiators were mounted at the rear, as close to the engine as possible, to minimize the pipework, the fluids contained within them, and therefore weight. They were also mounted in car line to minimize vehicle width. * ‘MP4' has been the chassis designation for all McLaren Formula 1 cars since 1981. It stands for McLaren Project 4, resulting from the merger of Ron Dennis' Project 4 organisation with McLaren. * The ‘12' refers to McLaren's internal Vehicle Performance Index through which it rates key performance criteria both for competitors and for its own cars. The criteria combine power, weight, emissions, and aerodynamic efficiency. The coalition of all these values delivers an overall performance index that has been used as a benchmark throughout the car's development. * The ‘C' refers to Carbon, highlighting the unique application of carbon fibre technology to the future range of McLaren sports cars. The McLaren MP4-12C is powered by a twin-turbocharged, 3.8 litre 90° V8 engine – the ‘M838T'. This marks the start of a new era in ‘core' segment sports cars – smaller capacity, lighter weight, higher efficiency and more economical power units. The engine has the highest specific power output in its segment which, when allied to its low weight carbon composite chassis, delivers exemplary power- and torque-to-weight ratios. The high level exhaust pipes exit through a mixing box, rather than a conventional and heavy silencer box. All parts of the exhaust system up to the mixing box feature sandwich layer heat-shielding that helps reduce heat from the engine bay. In just an 18mm gap, exhaust gas temperatures reduce from 900°C to 300°C. The interior is extremely space efficient and is designed to accommodate 98th percentile adults in comfort. This has been partly achieved by the 7 inch touch screen telematics system oriented in ‘portrait' mode. This is a first for the automotive industry and is more intuitive than ‘landscape' orientation – we read down a page and our mobile telephones and other personal information devices are configured this way. * ‘Active' activates all the dynamic controls. * ‘Winter' sets powertrain, suspension and electronic aids to maximum driver support. * ‘Launch' initiates the launch control system. * The two rotary switches control ‘powertrain' and ‘handling', each having three position settings for normal, sport and high performance driving modes. * ‘Powertrain' changes throttle response, gearbox strategy, shift times and impulse (how much one can feel the gearchange). The coaxial ‘Manual' button controls use of manual gearbox functions. * ‘Handling' changes stability control, steering weight, suspension firmness and roll stiffness. The coaxial ‘Aero' button allows the driver to deploy the airbrake for increased downforce.